The Jack McGee Kawartha Komets Special Needs Hockey Program is pleased to announce our partnership with “Team 55 Let’s Tackle Suicide Awareness”. The Kawartha Komets, a not-for-profit hockey program, was launched in 2009 to give girls, boys, teens and adults with physical, emotional and/or neurodevelopmental challenges an opportunity to play the game they love…hockey. The Komets will face off against the Peterborough Petes in a fundraising game on December 8th at 3:00 p.m. at the Peterborough Memorial Centre. This will help with the considerable costs involved in sending our teams to the Special Hockey International Tournament in Fraser, Michigan from May 1st – 3rd, 2014. Admission is FREE but our players will be collecting pledges and donations in the weeks leading up to this exciting event. The public will have opportunities do make a donation at the game as well. The first $1,000 raised as a result of the Komets’ fundraising game with the Petes will go to support the initiatives of the Team 55 Let’s Tackle Suicide Awareness program. “Team 55 Let’s Tackle Suicide Awareness” first goal was to open the conversation about suicide to the community so that those who may have been touched by suicide or are at risk of harm themselves, are encouraged to talk and share their feelings and ultimately to get help. 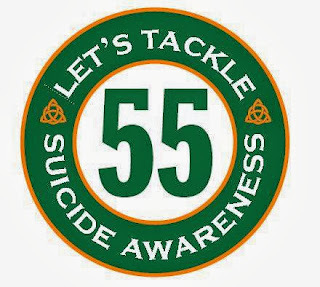 The second goal of Team 55 is to incorporate an educational component into the high school curriculums in Peterborough and area to help young people become suicide safe. Education around suicide helps to reduce the stigma of suicide and mental illness and increases the likelihood that those troubled with thoughts of suicide will get help. As well, when peers, teachers and parents are trained to recognize those at risk of suicide they can better have those conversations to direct them towards resources to help them. These initiatives will move forward in collaboration with the Canadian Mental Health Association, Haliburton, Kawartha, Pine Ridge (CMHA HKPR) For anyone with problems coping, at risk of suicide or are concerned about someone else, they can call CMHA’s Four County Crisis Response program, 24 hours a day, at 705-745-6484 or 1-866-995-9933 . The Jack McGee Kawartha Komets are pleased to partner with the Peterborough Petes, CMHA HKPR and Team 55 Let’s Tackle Suicide Awareness to help further this very worthy cause. The Komets are still taking registrations for the 2013-2014 season and, due to the ongoing expansion of our program, are looking for more coaches and volunteers. We presently have four teams with a total of 60 players.